There is something captivating about islands. Not only do they stand alone against the wind and water, divorced from the comforts of the mainland, but their inhabitants too have a special constitution that drives them to live a relatively isolated life. Canada, with its wide landscape, lakes and extensive coastline presents an array of island adventures in many shapes and sizes. Here are 10 of our favourites. Prince Edward Island (PEI) is the only province of Canada to have no land boundary. One of Canada's older settlements, PEI still reflects the country's heritage, with Celtic, Anglo-Saxon and French descendants comprising a large part of the 140,000 people that live there. Famous especially as the setting for L.M. Montgomery"s landmark first novel about the red-haired orphan, Anne of Green Gables, Prince Edward Island's tourism is still largely dependent on visiting Anne fans. There are plenty of other ways to enjoy this maritime province though. Its slow paced way of life is conducive to a vacation steeped in wandering, perusing and relaxing amongst its towns, trails and beaches. Prince Edward Island access is made easy by Confederation Bridge, which joins it to New Brunswick and mainland Canada and is the longest bridge in the world that crosses ice-covered water. Known for its rugged, diverse and beautiful geography, moderate climate and unhurried way of life, Vancouver Island sits just off the mainland of British Columbia. A fact that can be confusing is that Vancouver Island is home to the provincial capital of Victoria, but not the province's most populous city, Vancouver. Vancouver Island fits an island stereotype in that it attracts artists, craftspeople, nature lovers and other people seeking a less hectic pace of life. Visitors here will notice an overall chill to the residents and a friendliness that seems to go hand in hand with life off the mainland. Getting to Vancouver Island is by plane, helicopter, or ferry. The BC ferry system is extensive and regular and a beautiful ride. Located at the tip of Nova Scotia, Cape Breton is part of this maritime province but has an identity very much its own. Famous for its Celtic heritage, which visitors may enjoy through the music, food and charm of the people, Cape Breton is also home to one of the world's most beautiful drives: the Cabot Trail, as well as the Fortress of Louisbourg National Historic Site, an in-tact fortress, once one of the busiest harbours in North America and key to France's trade and military strength. Fogo Island sits at the edge of Canada, off the east coast of Newfoundland and Labrador. First settled by English and Irish in the 17th century, Fogo Island was an important fishery until the 1950s when it fell on hard times. Due to intervention from a number of sources, the island avoided resettlement and in fact has had a striking renaissance as an artists community and travel destination. Manitoulin Island is the world's largest freshwater Island. There are more than two dozen small settlements, first nations and towns spread out across more than 160 kilometers of boreal forest, lakes, rivers, shorelines, escarpments, meadows and alvars. The people and the communities have emerged through a history as ​colourful and complex as any in Canada – from the fur trade to free trade, from the ice age to the new age. The Magdalene Islands are in the heart of the Gulf of Saint Lawrence, and famous for their sand dunes, red sandstone cliffs and undulating landscape. The "Maggies," as they are affectionately known, comprise a unique mash-up of Acadian, Mi’kmaq and English cultures. Foodies, nature lovers, photographers and local craft enthusiasts will all love a visit here. Haida Gwaii (formerly the Queen Charlotte Islands) is an archipelago on British Columbia's north coast. These 450 islands that lie 80km west of the BC coast are largely protected lands and inhabited by Indigenous Peoples. They attract visitors for their abundant and rare wildlife species, flora and fauna and the seductive Haida culture and heritage. 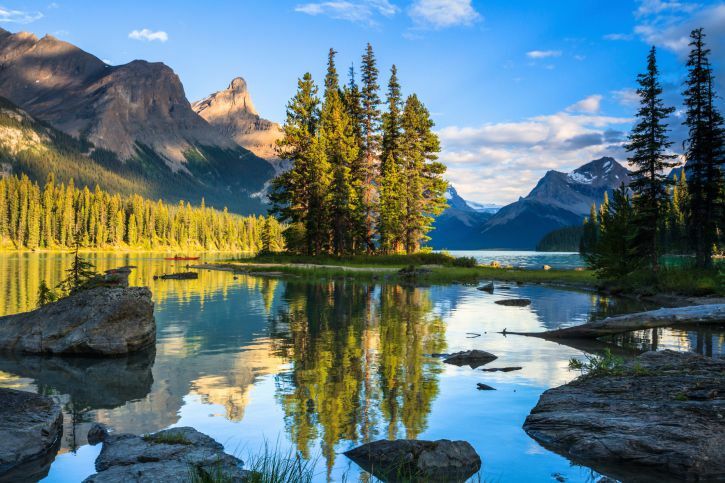 Spirit Island is the understated, yet perfect finale that concludes the cruise that bears its name, crossing the glacial waters of Maligne Lake in Jasper, Alberta. The 90-minute boat ride immerses its passengers in a majestic Rocky Mountain landscape, but it is the lone island - small but enduring, isolated but tied tenuously to land - that captures our imagination and makes it a favourite for photographers. The largest island in Canada and the fifth largest island in the world, Baffin Island is a sweeping Arctic landscape that offers a plethora of northern wonders to those adventurous enough to travel there. With a population of only 11,000 people, Baffin Island, in Nunavut, Canada's newest territory, is vast and sparsely populated - mostly by Inuit people. Accessed only by boat or plane, visitors can have a truly unique, remote experience in which they encounter an environment and wildlife unlike any they've encountered before. The Inuit people who live here value sharing as one of the most important characteristics and warmly welcome visitors. One of the most popular ways to visit Baffin Island is through Adventure Canada, an expedition cruise line that not only visits smaller communities but builds relationships with and supports them.